In the States we have so many unnecessary luxuries, like a laundry room and a clothes dryer. Think of all the space those two things take up. Oh, the travesty. If you’re in Italy, you better learn how to manage your dirty clothes before they start to pile up on you. 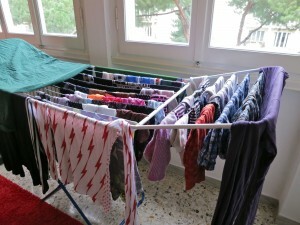 So, if you’re still in a deep wave of culture shock here’s an easy step-by-step on how to do laundry like an Italian. make sure there’s no extra space, so cram them in there! UPDATE: Ha, after this post was written, a dear Parisian friend sent me this! It looks like the French endure the same kind of laundry pleasure that the Italians do. Looks like it even takes more than 3 days to dry! Thank you 🙂 This is something I always laugh about, so finally wrote about it. are you on any chat? Haha! Sounds exactly like doing laundry in Paris. My washing machine/cooking counter is in my kitchen. 4-tier drying rack is in the living room. For sheets, I splurge and go to the laundromat to use the dryer (1euro = 10 min). Oh, the wonders of living in a tiny European apartment. Silvia I need to see a picture of this! lol. It’s amazing how this has become so normal for me, but when I stop to think about it I start cracking up. ‘Splurging’ for us was dry cleaning our goose down duvet. Awe, it’s so nice and crisp now. So glad I found your blog…not sure how I’m just now finding it. This post is sooooooo true. Hi Kate, I love your posts and congrats on the new arrival! Thanks for stopping by. Yes, laundry here is so ridiculous, you gotta laugh. I should be thankful that I don’t have to go to a coin laundromat. At least I can do it at home, but still. Mamma mia! Tiana, in my town – population 20,000 souls including all the frazioni – there are no fewer than THREE coin-op laundomats which do a whopping business with duvets at the change of season – AND the dryers run 24/7 all winter. 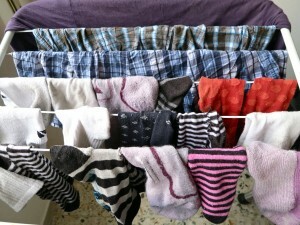 Even Italian women (who would iron underpants and socks when I first arrived in the 1970s) have finally realized that if you dedicate half a day to the dryers, and fold the stuff hot out of the drum, you don’t HAVE to iron anything except maybe a dress shirt or two. Those of us who struggle with winter fogs all have “discovered” dryers. Fresh out of the dryer is also so nice! Ah, heat, I forgot what it felt like to have a pile of fresh hot laundry thrown on me…childhood goodness. This made me laugh! So true! I miss dryers! Ha, yes, it isn’t the worst thing, just a funny things I have had to get used to. Hilarious post! I relate to so many of your well written points: 6, 10, 11 and find a place to hide clothes while drying…preferably where your guests can see it! Spot on! Thanks for the chuckle today. Well thanks for passing by, glad you got a chuckle out of it! Cute. You forgot to mention using the radiators for drying. In every room. So you can be absolutely sure your guests will see your underwear. Very true! I forget to use them since when I do laundry there is just so much and so little radiators BUT I do resort to them for emergency purposes. This is all so true. Except I’ve just given up on ironing altogether (the wrinkles wear themselves out in a few minutes… right? ), and I’m often guilty of letting towels and underwear linger on the rack (which thankfully is hidden in the spare bedroom) for at least a week before I remember to put them away. I gave up ironing. Now that I realized my husband could care less I figured “what do I care if he’s wrinkled” I don’t and rather spend time on Instagram! Luckily most of my clothes don’t really need it, phew! Even in America with the convenience of a clothes dryer, I air dry most of my family’s laundry because I don’t want to risk fading, shrinking or damaging delicate fabrics by using the dryer. Instead of using clothespins and drying racks, I use the clothes hanger technique. It dries more laundry in less space and eliminates the crease in clothes due to the clothesline. Hang wet laundry, such as blouses, t-shirts or dresses, individually on clothes hangers. Pull taut the shoulders and seams, smooth down collars, etc. to reduce wrinkling. For pants, clip the waistband on hangers. 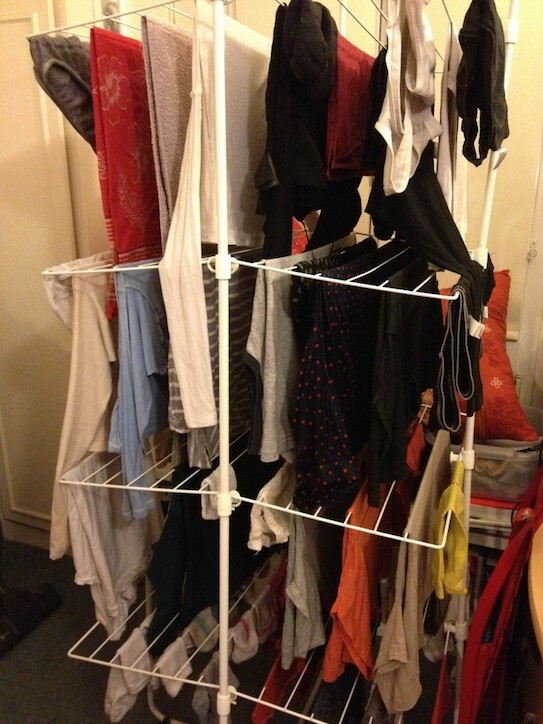 Arrange the hangers on a clothes rack evenly spacing them apart for air circulation. Sometimes when I run out of space in my laundry room, I put a rod between two chairs to place the hangers (I just stow the rod in the closet). You could also use a broom handle or a plastic pipe between any two level surfaces. I’ve even arranged the hangers on the edges of a table making sure the bottom of the clothes clear the floor. Steaming clothes instead of ironing is also a faster method. Our family will be visiting Italy for three weeks this summer (in Florence for two weeks!) and we’re lucky that there’s a washing machine in our rented apartment. The insights and tips in your blog are very helpful and I’m less stressed about revisiting Florence after a 30 year absence. I hope my suggestion helps! Wow, the work we do just to dry a top! Back home I had more space to hang delicates on hangers, my Mom does that with many of her tops. Happy planning and I hope you all have an amazing time back in Florence! This is also in chile as well, esp. the winter 3 days thing argh. Ya winter is the worst! Luckily we get sun in our living room to help dry the clothes, but it still takes a long time!